I don’t read a lot of horror. Well to be honest, I don’t read any horror. But Giselle at Xpresso Reads really loves this series, and I’ve been meaning to read it for a while. When I discovered my local library has a copy of The First Days, I rushed out to grab it. This action filled book does not disappoint, cleverly managing to portray all the horror of the zombie apocalypse without freaking me out. It features very real relationships and raw human emotions as the characters struggle to survive in a world gone mad. The two female protagonists of the this book are a powerful and witty duo, who ensnared my heart early on. They have both been through hell and are now one another’s only source of support. In the gritty and horrifying first chapter we meet Jenni, who has watched her husband eat, yes eat, their toddler and attack their teenaged son, and now her whole family is trying to kill her. She is rescued by Katie: a strong, stubborn woman who hears her screams and picks her up. Thus begins the ultimate test of survival for our leading ladies. I liked Katie a lot. She is the person I want around me when the zombie apocalypse comes – one is almost guaranteed survival because of her quick thinking and lightening reflexes, combined with her seemingly unending compassion for those around her. Katie is also gay, which throws a lot of people. I love how Frater explores the misconceptions and sometimes idiotic ideas people generally have about the homosexual community in a gentle and yet clear manner. Some people around Katie treat as though they have nothing in common with her or that they expect her to act irrationally or something and it’s really bizarre but also eye-opening. However, I found myself quickly tiring of Jenni. She is like a vine, needing someone strong to hold her up and provide with a sense of self worth. She has almost zero self esteem, but discovers early on that she has a knack for shooting the undead in the head. She swings between extremes of emotion and generally acts more than a little crazy, earning her the nickname ‘Loca‘. She is easily attracted to any strong man she meets, and becomes jealous at the mere sight of any female. Jenni is possessive of Katie, not wanting anyone else to become Katie’s friend and always seeking to reassure herself that she is still Katie’s best friend, like a ten year old. The plot of the book is amazing – while there aren’t many lulls, it doesn’t seem like things go wrong just for the sake of providing action for the plot. Everything that happens is explained and has plausible causes. A lot of the horror in the book comes not from the zombies, but from human moments with the survivors. These moments highlight how much the world has changed and how terrifying it all is. The zombies eating and killing and being killed is gory, but I did not find it particularly scary. 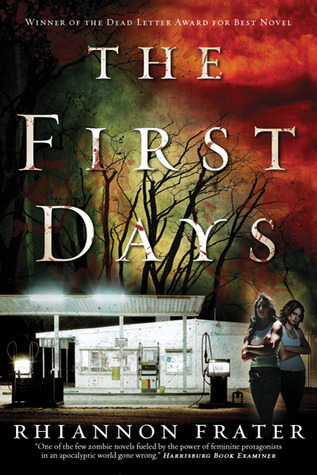 If you’re tired of repetitive story lines or looking for an explosive read, I highly recommend The First Days to you. I think a lot of people will be pleasantly surprised by this book, and it’s definitely fresh in its subject matter and outlook, which I love. I have requested copies of books 2 and 3 from my library, so hopefully I can continue this wonderful series in the near future.